Last month, I chose Desmos as one of my picks for best new education startups of 2011, in no small part because of the company's mission to create educational software so that interactive content is Web-based and works across multiple devices and platforms. In light of my recent screed about Apple's recent education event -- the app-ification of iTunes U, a new proprietary file format for e-books, a purported education "revolution" that's iOS-only -- it's probably pretty clear that I believe strongly that if we are to invest in technology tools that we must do so in ways that are accessible and interoperable and that actually benefit learners. And with that, folks, I give you... the World Wide Web. 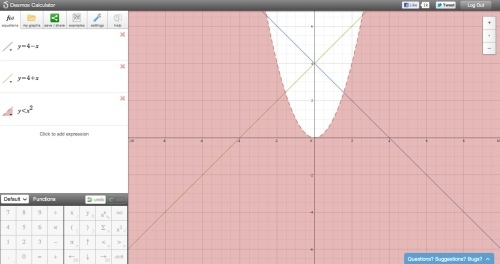 So, clearly, when Desmos launched last year, I was thrilled, particularly when co-founder Eli Luberoff showed me a little side project his team was hacking on: a free, Web-based graphing calculator. Despite all the fussing and fighting about whether or not we should let technology into the classroom and who should pay for it when we do, fact of the matter is a lot of schools do still require students (students' families) to purchase a graphing calculator. And for decades now, one company has dominated that market: Texas Instruments. Prices vary, but on average you're looking at spending at least $55 on a graphing calculator for your high school student -- and that's at the low end of a gadget market that quickly gets pretty damn spendy. So the launch of a free graphing calculator is a blow to that hardware monopoly no doubt. And the graphing calculator that Desmos has built isn't just a quick and dirty graphing tool (such as what you get now if you type an equation into a Google search). It contains features you won't find elsewhere -- things like dotted lines for graphing inequalities; slide bars for variables; support for polar inequalities; trace, intercepts, roots, and intersections. Luberoff has been maniacally wonderful (wonderfully maniacal?) about getting this all right -- no surprise as he was a double math and physics major at Yale. He's also been a math tutor, so he understands what it means to have a tool that aids teaching and learning. But one problem, up 'til now, with the app: it was Flash-based, rendering it unusable on iOS devices (and undermining the company's mission to make tools that work across all platforms). No longer. The calculator has been redone in HTML5 (no easy task, I should note) and is now available at abettercalculator.com. Luberoff says that the company is going to be putting a lot more effort into furthering the development of this tool (it may well be, in fact, the direction that Desmos will now take, focusing on this calculator rather than its broader approach to interactive software tools). He's asking for folks who find bugs or have suggestions drop him an email.